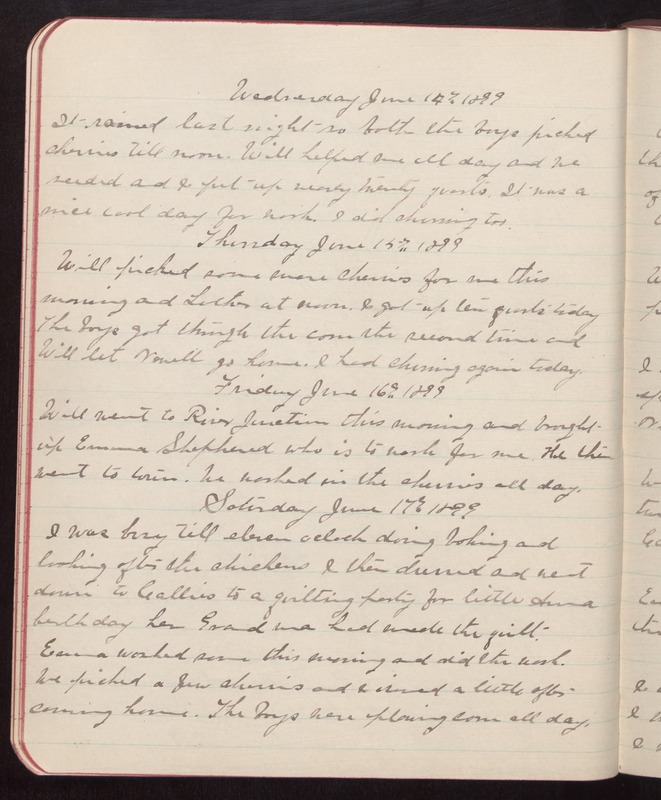 Wednesday June 14th 1899 It rained last night so both the boys picked cherries till noon. Will helped me all day and we seeded and I put up nearly twenty quarts. It was a nice cool day for work. I did churning too. Thursday June 15th 1899 Will picked some more cherries for me this morning and Luther at noon. I got up ten quarts today The boys got through the corn the second time and Will let Newell go home. I had churning again today. Friday June 16th 1899 Will went to River Junction this morning and brought up Emma Shepherd who is to work for me. He then went to town. We worked in the cherries all day. Saturday June 17th 1899 I was busy till eleven oclock doing baking and looking after the chickens I then churned and went down to Callies to a quilting party for little Anna birthday her Grandma had made the quilt. Emma worked some this morning and did the wash. We picked a few cherries and I ironed a little after coming home. The boys were plowing corn all day.